We have been to Las Vegas plenty of times. Sometimes people ask us why we keep going back instead of somewhere new. We travel to plenty of other places, but we keep going back to Vegas because it can be something new every time you go! Besides the casinos and great restaurants, there are so many things to see and do. From dune buggies in the desert to world-class spas to learning about the history of Las Vegas. I just got back from another trip to Vegas and visited a place I've wanted to see for a long time - the Neon Boneyard. Las Vegas has a long history of using neon lights to attract gamblers, but it also has a history of imploding old hotels to make room for newer ones. The Neon Museum has started to save and restore some of the old neon signs from these hotels and display them as part of Vegas history. I love this stuff. Only a few of the signs have been completely restored. Most are in various states of disrepair. But the desert sunset and the outdoor museum lighting makes them look very dramatic. The museum building used to be the La Concha motel. It was reassembled in its current location. I love the architecture of this building. It's a famous example of "Googie" architecture, a type of mid-century modern design. The motel's old sign is one of the few neon signs at the museum that has been completely restored. It costs tens of thousands of dollars to repair the neon. The museum hopes to restore more signs as it raises the money. Most of the signs are lit from below with coloured spotlights. The spotlights change colours and light different letters for a really cool effect. This sign has twisted neon in the shape of a tree. But this was one of my favourites. I also really loved the 4-pointed stars. 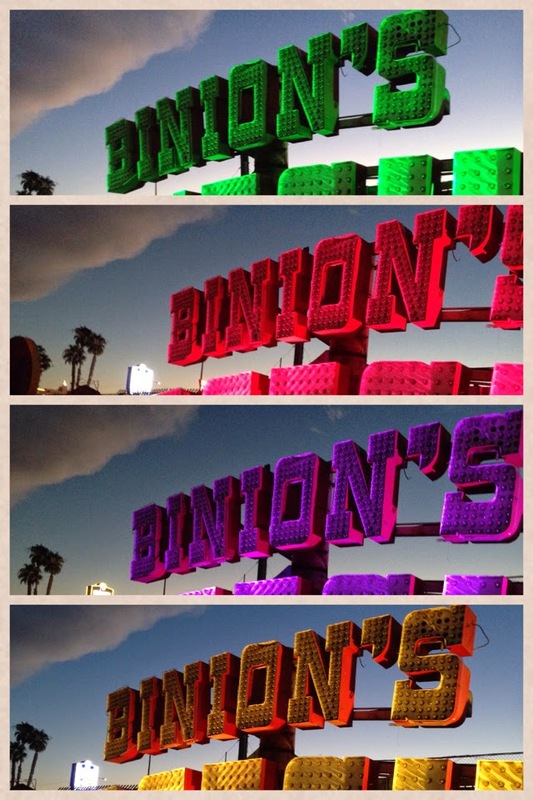 The Neon Museum has hourly guided tours in the daytime and night time. We did the 7:30 twilight tour so we saw the signs in day and night and it was perfect. The museum is close to downtown Las Vegas, but it's best to drive or take a cab to get there.